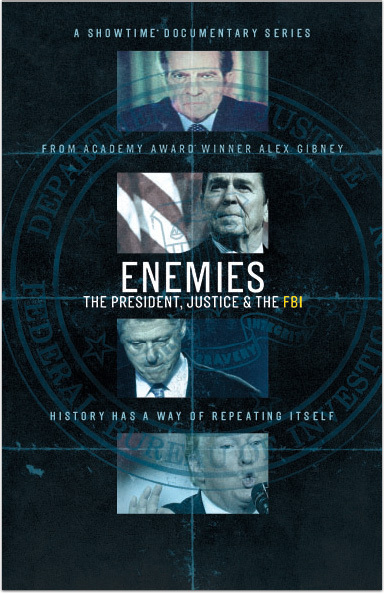 From ACADEMY AWARD® winning filmmaker Alex Gibney comes the Showtime Documentary Series ENEMIES: THE PRESIDENT, JUSTICE & THE FBI. Who enforces the law when the President is accused of breaking it? Four Presidents have gone head to head with the FBI amid allegations of abuse of power and violations of law. Richard Nixon, Ronald Reagan, Bill Clinton and now Donald Trump have each faced the full power of a federal investigation, setting off constitutional crises that threatened the very foundations of our system of government. In today’s climate of maximum political turmoil, these past scandals reveal how conflict at the highest levels can redefine the presidency itself. Enemies: The President, Justice & The FBI © Showtime Networks Inc. All rights reserved. Academy Award® is a registered trademark and service mark of A.M.P.A.S. SHOWTIME and related marks are trademarks of Showtime Networks Inc., a CBS Company. You must be a subscriber of SHOWTIME to receive SHOWTIME ON DEMAND.